This service is to help draw commitment and healing to relationships that can't seem to progress. 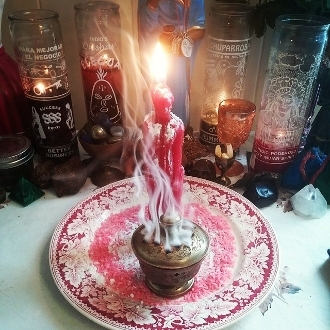 It is a 2 day service, during which I will created a loaded and dressed figure candle representing your desired partner for you. I'll then create a petition and inscribe the candle according to the name and/or characteristics you desire in a mate. I will then set the proper offerings and evoke Oshun to help you achive your goal. ********A full report containing 5-10 photos will be emailed when the work is close to completion or upon completion. ********Please provide names, DOB and the details of your situation as well as you goals in the "special instructions" area on your order form. Photos should be e-mailed to conjuredcardea@gmail.com. YOUR ORDER WILL BE CANCELLED IF NO INFORMATION IS PROVIDED ON YOUR FORM. ***PLEASE ALLOW UP TO 7 DAYS FOR THE FULL PROCESS AND REPORT OF THE WORKING. THIS ENSURES THERE IS ADEQUATE TIME FOR COMPLETION AND DISPOSAL OF THE WORKING. I WILL NOT REPSOND TO QUESTIONS THAT HAVE ALREADY BEEN SPECIFIED, IN DETAIL, IN THIS LSITING.